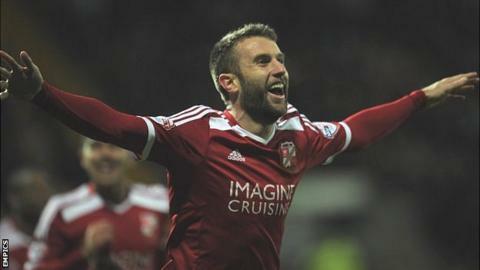 Swindon Town stayed top of League One on goal difference with victory over Chesterfield in an entertaining match. Jack Stephens headed the Robins in front after 17 minutes, but Sam Clucas fired the visitors level. John Swift's clinical strike restored the lead, but Jimmy Ryan almost equalised when his volley hit the bar. Town sealed an eighth win in 10 games after half time when Swift put Andy Williams through for his 18th league goal of the season. Chesterfield's first defeat in eight matches leaves them a point outside the play-off places in eighth. "I'm a bit disappointed in the performance. First half we were ok, in patches we played well, but second half, I didn't think we were very good at all. "We were a little bit panicky and a little bit rushed. I thought Chesterfield were quite clever in what they did. "Their game plan was to play in the second half and they saved everything they had for the second half. Luckily, we got the third goal at the right time." "I think everyone as a neutral knew it would be a good game, which it turned out to be, but we've conceded really poor goals today. "When you give poor goals away, you're going to struggle to win any game. "I think Swindon are a fantastic team and I hope they go on and get promotion because they deserve it." Match ends, Swindon Town 3, Chesterfield 1. Second Half ends, Swindon Town 3, Chesterfield 1. Substitution, Swindon Town. Jack Barthram replaces Harry Toffolo. Andy Williams (Swindon Town) wins a free kick on the right wing. Attempt saved. Dan Gardner (Chesterfield) right footed shot from outside the box is saved in the top right corner. Substitution, Chesterfield. Emmanuel Dieseruvwe replaces Gary Roberts. Substitution, Chesterfield. Dan Gardner replaces Sam Clucas. Substitution, Chesterfield. Jay O'Shea replaces Eoin Doyle. Attempt missed. Andy Williams (Swindon Town) right footed shot from the centre of the box is too high. Attempt saved. Anton Rodgers (Swindon Town) right footed shot from outside the box is saved in the top right corner. Charlie Raglan (Chesterfield) wins a free kick in the attacking half. Eoin Doyle (Chesterfield) wins a free kick in the attacking half. Substitution, Swindon Town. Anton Rodgers replaces John Swift. Attempt missed. Armand Gnanduillet (Chesterfield) right footed shot from outside the box is close, but misses to the left from a direct free kick. Substitution, Swindon Town. Jonathan Obika replaces Michael Smith. Attempt missed. Armand Gnanduillet (Chesterfield) header from the centre of the box is just a bit too high. Corner, Chesterfield. Conceded by Jack Stephens. Attempt blocked. Armand Gnanduillet (Chesterfield) header from the centre of the box is blocked. Corner, Chesterfield. Conceded by Raphael Rossi Branco.